Global Strategy Group is working with Nestlé Waters North America to amplify its support of The Partnership for a Healthier America's Drink Up initiative. STAMFORD, CT: Global Strategy Group is working with Nestlé Waters North America to amplify its support of The Partnership for a Healthier America’s Drink Up initiative. It most recently promoted the company’s involvement with the Partnership’s Building a Healthier Future Summit last week. The organization works with the private sector and First Lady Michelle Obama, who is also its honorary chair, to end the childhood obesity epidemic. The summit took place March 12-14 in Washington, DC. 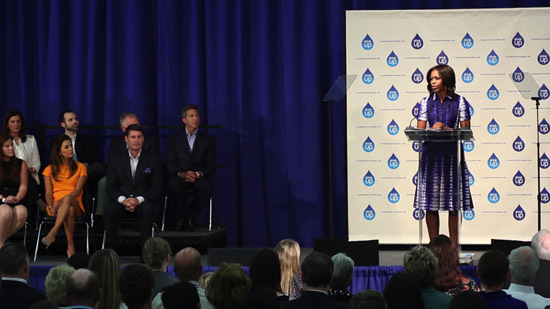 Obama’s Drink Up campaign is a nationwide initiative promoting the role hydration plays in health and wellness. "[Nestlé Waters North America] announced its support of the campaign in September when it kicked off; the campaign continues into this year and includes activities such as [last] week’s Summit, which [Nestle Waters’] president and CEO, Tim Brown, presented at," said Victoria Rupeka, Global Strategy Group’s director of comms. Nestle Waters North America and Global Strategy Group did not immediately disclose outreach details or the communications strategy for the campaign. The agency has been working with Nestlé Waters since last summer, and was brought on as the company’s AOR for corporate reputation in November. The firm is tasked with aiding Nestle Waters with thought leadership, influencer engagement, media relations, and digital and social strategy. "[Global Strategy Group] is working on our corporate positioning, programs, and corporate social media, such as [our] new corporate Twitter account and blog," said Nestlé Waters director of comms Jane Lazgin. Nestlé Waters also works with other communications firms specific to business goals, such as business media, brand communications, and brand events. Lazgin would not disclose details about the other comms firms the company is working with. Cone Communications, the company’s previous AOR, wrapped up its relationship with NWNA in October. "We lost the [NWNA] account because they were just reprioritizing their PR needs," said Cone CEO Bill Fleishman. Earlier this month, Global Strategy Group hired Andrew Kirtzman and Alex Flores as VPs and Emily Williams as director. Last month, Marc Litvinoff was named managing partner, a new role at the firm.